It was on the 27th day of July, in the year 2006 that Zacky went gently into the night across the Rainbow Bridge. Almost 9 years to to the day he literally “jumped” into our lives with gusto, but also with much gentleness. With his passing, he left a very large void in our hearts that can never be filled. There will never be an equal to Zacky, there may be others, but not a Zacky. He was a good guy, and I know that he is in heaven, and if I make it there, I know he will be waiting for me at the gate, wagging his tail, waiting for his “bonies”. He would carry his dish filled with food and place it where he wanted it and it had to rest on his left paw. He used to claw me when he wanted something. I would yell, but today I wish he was here to do it again, believe me, I would not yell. 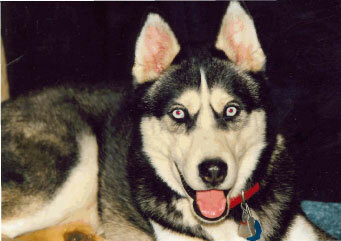 Zacky was like many Huskies, stubborn, turn his back to you, “forget” his name at times, and in his younger days, love to run free. But unlike other Huskies, he would “dance” his left paw would go up and down til he was satisfied he was sitting straight and beautiful. Dinner was another highlight at our house. He would “dance and prance” between us and always nudge my wife or a female guest at the most inappropriate place and always on the left side. He loved “people” food. Always gentle and never grabbing from our hands, until he learned to eat from a fork. Yes, Zacky is gone, he now wears the Silver Harness, but he will never be forgotten, replaced and no other will ever take the place of Zacky. Why do the ones we love the most leave us so soon?